EDITOR’S NOTE: The term ‘blockade’ means: ‘an attempting starving into surrender of an enemy by preventing goods from reaching him or leaving him’ (Longman Modern English Dictionary’. Thus the barrier is NOT a blockade. It is there to prevent weapons reaching those inside that they might then use to harm you. Goods and services are supplied to them. If they wished to live in peace with Israel and Egypt then the wall could be torn down. Publicity Gaza issues refers to it only being between themselves and Israel. This is wrong. Part of the wall is between Israel and Gaza and part between Egypt and Gaza. Each have their own gates. The Egyptian gate is usually closed Many tunnels go from Gaza to Egypt. As shown below Egypt is making a major effort to block them. The Israel−Gaza security barrier is a border barrier first constructed by Israel in 1994 between the Gaza Strip and Israel. The barrier runs along the entire land border of the Gaza Strip. Entry into the Gaza Strip by land is through five crossing points: the northern Erez Crossing into Israel, the southern Rafah Crossing into Egypt, the eastern Karni Crossing used only for cargo, and the other cargo crossing points, the Kerem Shalom Crossing on the border with Egypt and the Sufa Crossing farther north. In 1993, Israel and the Palestinian Liberation Organization signed the Oslo Accords establishing the Palestinian Authority with limited administrative control of the West Bank and Gaza Strip. Pursuant to the Accords, Israel has continued to maintain control of the Gaza Strip's airspace, land borders (with the exception of Gaza's border with Egypt, abandoned by Israel in 2005), and territorial waters. Israel started construction of the first 60 kilometers (37 mi) long barrier between the Gaza Strip and Israel in 1994. In the 1994 Interim Agreement on the West Bank and the Gaza Strip, it was agreed that "the security fence erected by Israel around the Gaza Strip shall remain in place and that the line demarcated by the fence, as shown on the map, shall be authoritative only for the purpose of the Agreement" (i.e. the barrier does not necessarily constitute the border). The barrier was completed in 1996. From the Israeli perspective, the Israel–Gaza Strip barrier is a security barrier intended by Israel to control the movement of people between the Gaza Strip and Israel, to stop the entry of arms into the territory. It has significantly improved security in Israel. The Israel-Gaza Strip barrier has met with opposition and protests from some Palestinians. The barrier was largely torn down by Palestinians at the beginning of the Al-Aqsa Intifada in September 2000, followed by many terror attacks. The barrier was rebuilt between December 2000 and June 2001. A one-kilometer buffer zone was added, in addition to new high technology observation posts. Soldiers were also given new rules of engagement, which, according to Ha'aretz, allow soldiers to fire at anyone seen crawling there at night illegally into Israeli territory. Palestinians attempting to cross the barrier into Israel by stealth have been shot and killed. The barrier's effectiveness prompted a shift in the tactics of Palestinian militants who commenced firing Qassam rockets and mortars over the barrier. The barrier has been effective in preventing terrorists and suicide bombers from entering Israel from Gaza. Since 1996, virtually all suicide bombers trying to leave Gaza have detonated their charges at the barrier's crossing points and were stopped while trying to cross the barrier elsewhere. From 1994 until 2004 a suicide bomber originating from within the Gaza Strip successfully carried out an attack in Israel (the March 14, 2004 attack in Ashdod). In 2005, Israel unilaterally withdrew its troops from the Gaza Strip, along with thousands of Israeli settlers. Israel thus claims to have ended the occupation. However, this claim has been challenged on the basis that Israel continues to exercise control over Gaza's territorial waters and airspace, despite Gaza not being part of Israel and Gazans not having Israeli passports. In June 2007, Hamas took over Gaza, ousting the forces of Fatah, the faction led by Palestinian Authority President Mahmoud Abbas and effectively separating Gaza from the West Bank in terms of its administration. Hamas had won legislative elections in January 2006. Israel intensified its blockade of the Gaza Strip in June 2007, when Hamas took power and began increasing its rocket fire into Israel. On 27 December 2008, Israel launched the Gaza War, consisting of airstrikes and ground incursions against targets in the Gaza Strip, with the stated aim of stopping the rocket fire from and arms smuggling into the territory. The war ended on 18 January 2009, when both sides ceased military action. Israel completed its withdrawal on 21 January, and thousands of rockets and mortars have been fired from the Gaza Strip since. There are three main crossing points out of the Gaza Strip: the northern Erez Crossing into Israel, the southern Rafah Crossing into Egypt, and the eastern Karni Crossing used only for cargo. Other cargo crossing points are the Kerem Shalom border crossing on the border with Egypt and the Sufa Crossing further north. From the Palestinian perspective, the crossings are crucial to the economy of the Gaza Strip and to the daily needs of the population. Chief Palestinian Authority negotiator Saeb Erekat described closures of the crossings and said they have "proven to be counter-productive"
The Erez Crossing is a pedestrian and cargo crossing into Israel, located in northern Gaza. The crossing is currently restricted to Arab residents under the jurisdiction of the Palestinian Authority and to Egyptian nationals or international aid officials only, and is closed to tourists. Palestinians who have a permit to work in Israel or those with permits allowing them to receive free medical treatment or to visit immediate family who are in prisons may use this crossing when it is open for pedestrian travel. Though 5,000 Palestinians are permitted to use the Erez Crossing to go to their places of work inside Israel, the crossing was frequently closed by the Israeli authorities, impeding their ability to get to work. Additionally, the permits issued have not always been honoured by soldiers, who in some cases confiscated them at the crossing. The Karni Crossing is used for cargo traffic. The Karni crossing is often closed by Israel after regular attacks by Palestinian militants on Israeli targets. Israeli officials have cited ongoing threats against its security, inaction against terrorist group activity on the part of the Palestinian Authority, and a lack of other choices. On 25 June 2006 Palestinians used an 800-metre tunnel dug under the barrier over a period of months to infiltrate into Israel. They attacked a patrolling Israeli armored unit, killed two Israeli soldiers, and captured another one, Gilad Shalit. Between January and October 2013, three tunnels under the Israel border were identified – two of which were packed with explosives. The discovery of similarly constructed tunnels in other parts of the world have led to threat assessment estimates. In the summer of 2017, Israel began the construction of a border wall which stretched several meters underground to counter tunnel assaults. The structure is equipped with sensors to detect future tunnel construction. Concrete for the structure was produced using five concrete factories dedicated to the project and about 10 meters was completed daily. The structure was placed entirely on Israeli land. The Rafah Border Crossing is the only crossing point between Egypt and the Gaza Strip. It is located on the international border that was confirmed in the 1979 Israel–Egypt Peace Treaty. Only passage of persons takes place through the Rafah Border Crossing. All goods traffic must use the Kerem Shalom border crossing on the Israel-Gaza border. On 1 October 1906, the Ottoman and British governments agreed on a boundary between Ottoman ruled Palestine and British ruled Egypt, running from Taba to Rafah. Although after World War I Palestine was also under British control, the Egypt-Palestine boundary was maintained to control the movement of the local Bedouin. From 1948, Gaza was occupied by an independent Egypt. Consequently, the border between the Gaza Strip and Egypt proper was a mere administrative boundary without border control. In the 1967 Six-Day War, Israel conquered the Sinai Peninsula and the Gaza Strip from Egypt, and again there was nominal border control. In 1979, Israel and Egypt signed a peace treaty that returned the Sinai, which borders the Gaza Strip, to Egyptian control. As part of that treaty, a 100-meter-wide strip of land, known as the Philadelphi Route, was established as a buffer zone between the Gaza Strip and Egypt. In the peace treaty, the re-created Gaza–Egypt border was drawn across the city of Rafah. When Israel withdrew from the Sinai in 1982, Rafah was divided into Egyptian and Palestinian parts, splitting up families, separated by barbed-wire barriers. Under the 1979 Egyptian–Israeli Peace Treaty, the Philadelphi Route buffer zone was a 100-meter-wide strip of land along the Gaza-Egypt border. Until 2000, the actual buffer zone was 20-40 meters wide with a 2.5 to 3 meters high concrete wall topped with barbed wire. During the Second Intifada, which began in 2000, Israel widened the buffer zone to 200–300 meters and built a barrier wall mostly of corrugated sheet metal, with stretches of concrete topped with barbed wire. The construction of the buffer zone required the demolition of entire blocks of houses at the main entrance to Rafah's central thoroughfare. In December 2009, Egypt started with help from the US, the building of an Egypt–Gaza barrier along the Gaza border, consisting of a steel wall. The Rafah Border Crossing is the only crossing point between Egypt and the Gaza Strip. It lies on the international border that was confirmed by the 1979 Israel–Egypt Peace Treaty and the 1982 Israeli withdrawal from the Sinai Peninsula. The Rafah Border Crossing can only be used for the passage of persons. All goods traffic must use the Kerem Shalom border crossing on the Israel-Gaza border. The crossing was managed by the Israel Airports Authority until Israel evacuated Gaza on 11 September 2005 as part of Israel's unilateral disengagement plan. It subsequently became the task of the European Union Border Assistance Mission Rafah (EUBAM) to monitor the crossing. The Egyptian army announced on February 2, 2018, the destruction of a tunnel under the Gaza border. A spokesman said that explosive devices in three warehouses, as well as a tunnel used by "terrorists," were destroyed. Over the course of 2017, the Egyptian army has destroyed 63 cross-border tunnels linking the Gaza Strip to Egypt’s Sinai Peninsula, the service added. The destruction of smuggling tunnels connecting the Gaza Strip with the Sinai Peninsula is one of several counter-terrorism initiatives taken by the Egyptian government in recent years. Egypt sees the tunnels as a passageway for arms and militants it has been fighting in North Sinai, posing a risk to the country's security. The network of smuggling tunnels connects Sinai with the Palestinian Gaza Strip, controlled by the Islamist Hamas movement. Hamas operates secret tunnels to facilitate the flow of weapons and militants into and out of Gaza. Hamas, which controls the Strip, effectively licenses the tunnels, providing electricity, taking a tax on smuggled goods, and banning the import of drugs, alcohol, and cigarettes. The excavation of smuggling tunnels in the Rafah area began in 1982, subsequent to the division of the Rafah city between Egypt and the Gaza Strip. The average smuggling tunnel is approximately 500 meters in length, and 20 to 25 meters deep. The tunnels may be equipped with wood-paneling, electrical infrastructure, communications gear, and rudimentary elevators in vertical shafts, to transport people or the freight of goods. The openings of the tunnels are often located within private Egyptian homes or other buildings, near or next to the border with Egypt. The Egyptian authorities claim that the tunnels are used by ISIS and other terrorists who target the army and police in Sinai. Following the Ansar Beit al Maqdis attacks of October 24, 2014, President el-Sisi has ordered the creation of a "buffer-zone" along the Egyptian border with Gaza in an attempt to quash the illegal tunnel trading between Sinai and the Gaza Strip. In January 2015, Egypt began work on doubling the width of the "buffer zone" along the border with the Gaza Strip. The "buffer zone" was initially planned to be 500 meters wide, but is now being expanded by another 500 meters. The Egyptian army gave over 1,100 families who lived within the "buffer zone" only 48 hours to evacuate their houses. North Sinai’s Governor Abdel Fattah Harhour has stated that every family will receive EGP300 (US$40) in housing allowance for three months, and further compensation will be given for demolished buildings. However, tribal leaders from the region have expressed their dissatisfaction with the sums offered. Filling the tunnels with sewage: Since 2013, the Egyptian military is resorting to a new tactic to shut down the smuggling tunnels: flooding them with sewage. It has since been revealed that this was not a flood of water, but rather human excrement – hundreds, thousands of gallons of raw sewage pumped into the tunnels. Filling the tunnels with seawater: The Egyptians dug a trench on the Sinai side of the border and then laid pipes parallel to the "buffer-zone" road, known as the Philadelphia Route. Water from the nearby sea was pumped in, creating a canal. The water channel flooded the tunnels, causing them to collapse. The Palestinians are trying to reinforce and waterproof their tunnels with cement and steel bars, hoping they would be saved from collapse if more flooding occurred. Egypt is creating a large fish farm in the Sinai penin­sula on the border with the Gaza Strip, providing an economic opportunity while also trying to halt smuggling through the network of tunnels between Sinai and the Pal­estinian territory. Tons of sand has been carried away, and huge tubes placed to pump seawater to destroy the smugglers’ tunnels and form the base of the fish farm. President el-Sisi has decided to combat Hamas's smuggling tunnels also through legal means. In April 2015, he signed a new law, according to which anyone who digs a tunnel along Egypt's borders would face life imprisonment. The new law came amid reports that some anti-government jihadists from Sinai had received medical treatment in hospitals inside the Gaza Strip. The reports confirmed fears of Egyptian government officials that the jihadists in Sinai are working together with Hamas to undermine security and stability in Egypt. Egyptian President Abdel Fattah el-Sisi's uncompromising war on terrorism, especially along the border with the Gaza Strip, seems to be bearing fruit. Egypt says the closing down of the tunnels is part of a crackdown against Islamist militants in the Sinai Peninsula and their supporters in the Palestinian territory of Gaza Strip. As a result of this war, which began in 2013, shortly after el-Sisi came to power, with the destruction of hundreds of smuggling tunnels along the border between Egypt and the Gaza Strip, Hamas and other armed groups are now more isolated than ever. President el-Sisi has shown real determination in his war to drain the swamps of terrorists. The tough measures he has taken along the border with the Gaza Strip have proven to be effective. The destruction of these tunnels will be a major counter-terrorism move, reducing the motivation and capability of Hamas to initiate new offensive from Gaza Strip against Israel. Reliance on the tunnels seems to have progressively declined, and Hamas has also been unable to acquire more weapons and ammunition, owing to the ongoing Egyptian campaign to eliminate the tunnels. One of the most pressing threats faced by the IDF in recent years is the network of cross-border attack tunnels from Gaza. Hamas, and other radical terror organizations in the Gaza Strip, have invested heavily in the tunnel industry, often at the cost of civilian rehabilitation. In the years since the 2014 Operation Protective Edge, Hamas’ civilian affairs budget has decreased, while its military budget has steadily grown, increasing from 15% of the annual budget in 2014 to 55% in 2016. It is estimated that Hamas has invested over $150 million in its tunnel building activities, while also endangering the many Gazans who engage in this dangerous work. The chosen locations of these tunnels further demonstrate Hamas' disregard for human life - tunnels are often built under civilian infrastructure in Gaza and end within close proximity of Israeli civilian towns, intentionally endangering both Israeli and Gazan civilians. The IDF holds Hamas responsible for these cross-border assault tunnels, which constitute a severe violation of Israel’s sovereignty and threatens the lives of Israeli civilians and soldiers. In 2016, 25 tunnels collapsed in Gaza, killing 21 tunnel diggers from Hamas, Palestinian Islamic Jihad and other radical organizations. In 2017, nine tunnels collapsed and tens of tunnels were destroyed by the Egyptian army as part of their crackdown on terrorist activity in the Sinai. These incidents resulted in the deaths of 33 members of Hamas and other Islamist organizations in the Gaza Strip. On numerous occasions, Hamas has exploited UNRWA facilities for its military operations. This phenomenon was first publicized during the 2014 Operation Protective Edge, when arms caches were discovered in UNRWA schools three times. Although UNRWA condemned this use of civilian buildings for military activity, Hamas has continued to employ this strategy in the years since the operation has ended. On June 1, 2017, UNRWA announced that it had uncovered a Hamas attack tunnel under two of its schools, the Maghazi Preparatory Boys School and the Maghazi Elementary Boys A&B School. 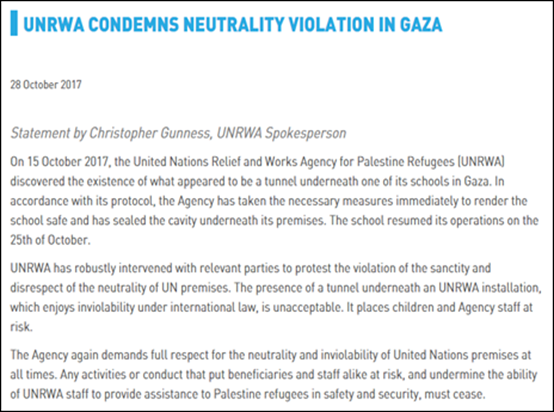 Again, on October 15, 2017, UNRWA discovered yet another tunnel under one of its middle schools in Beit Hanoun. This incident was condemned for endangering UNRWA workers and the students and for violating the neutrality of this civilian site. On October 10, 2017, the IDF destroyed a Palestinian Islamic Jihad (PIJ) cross-border assault tunnel that extended into Israel from the Gaza Strip. The tunnel was discovered less than two miles from the Israeli village of Kissufim. 12 PIJ fighters were killed in the explosion, five of them remaining trapped on the Israeli side of the border. One month later, on December 9, 2017, the IDF destroyed a Hamas cross-border tunnel that extended into Israel from the Gaza Strip. The tunnel began in Khan Younis and extended hundreds of meters into Israeli territory. The tunnel was destroyed using an innovative new technology, rather than with explosives, a method that avoided the deaths caused by the previous tunnel. On January 13, 2018, the IDF destroyed another Hamas cross-border tunnel. This tunnel, which crossed 180 meters into Israeli territory, was known to be a smuggling route for weapons and fighters in order to carry out terror attacks. Furthermore, the tunnel was located under the Kerem Shalom Crossing, a cargo crossing through which hundreds of trucks of commercial goods and humanitarian aid enter the Gaza Strip daily. The tunnel passed under three civilian sites, including a gas pipe, a fuel pipe and the main antenna of the crossing. Such strategic placement demonstrates Hamas' use of civilian infrastructure as a cover for its military activities and in doing so, endangers civilians. This tunnel further harmed the interests of the residents of Gaza who could not receive necessary goods through the crossing, which was closed temporarily due to the danger caused by the tunnel and its destruction. Khaled Abu Toameh, an award-winning journalist, based in Jerusalem. The Rafah border crossing is the Gaza Strip's single opening to Egypt and the rest of the Arab world. That border crossing is where the real suffering of the Palestinians has been taking place. As Hamas leader Ismail Haniyeh and other organizers of the campaign have clearly stated in recent weeks, the Palestinian protests are aimed at thwarting US President Donald Trump's yet-to-be-announced plan for peace in the Middle East. Meanwhile, no one will pay attention to what is happening on the Gaza Strip's other border with Egypt, which has been closed for most of the past 10 years. The demonstrations near the border with Israel are being organized by Hamas and other Palestinian factions in the Gaza Strip as part of the "March of Return" -- a six-week campaign of protests that is expected to reach its peak on "Nakba Day" ("The Day of Catastrophe"), the term used by Palestinians to describe the creation of the State of Israel in 1948. The Arab countries at the time opposed the creation of a homeland for the Jewish people and sent their armies to attack Israel, but lost -- a result that should probably be taken into consideration before one attacks. Since then, the Palestinians and Arabs have been commemorating their loss by holding anti-Israel protests and voicing their refusal to recognize Israel's right to exist. There are, of course, no demonstrations planned along Gaza's border with Egypt to protest the continued closure of Gaza's better-known border crossing, Rafah -- its crossing to Egypt. The Palestinians do not feel comfortable talking about Egypt's blockade of the Gaza Strip. They prefer to turn a blind eye to the severe travel restrictions imposed by Egypt on the residents of Gaza and instead put all the blame on Israel. Currently, Hamas leaders cannot leave the Gaza Strip without Egypt's permission. They are afraid to embarrass the Egyptians lest they be banned from leaving the Gaza Strip completely. The organizers of the "March of Return," including several Hamas leaders, have repeatedly made it clear in the past few weeks that the real goal of the campaign is to "achieve the right of return" for Palestinian refugees and their several generations of descendants to their former homes and villages inside Israel. For the Palestinians, the "right of return" means that Israel should allow millions of Palestinians to move to Israel -- a demand no Israeli government could ever accept as it would means turning the Jews into a minority in their own state. Thus, the "March of Return" is hardly about a "humanitarian crisis" in the Gaza Strip. Instead, it is a campaign designed to put the issue of the Palestinian refugees at center stage and let the world know that the Palestinians will not give up what they call their "right of return." The "March of Return," as Hamas leader Ismail Haniyeh said a few days ago, marks the beginning of a new Palestinian intifada, or uprising, against Israel. As Haniyeh and other organizers of the campaign have clearly stated in recent weeks, the Palestinian protests are aimed at thwarting US President Donald Trump's yet-to-be-announced plan for peace in the Middle East. The Palestinians claim that the plan is primarily aimed at "liquidating" the Palestinian cause and national rights. Some Palestinians have argued that the "March of Return" is also aimed at ending the blockade imposed on the Gaza Strip since Hamas's violent takeover of the coastal enclave in the summer of 2007. All eyes, then, are set on the border between the Gaza Strip and Israel -- but what about Gaza's other border crossing, the one with Egypt? The Rafah border crossing is the Gaza Strip's single opening to Egypt and the rest of the Arab world. That border crossing is where the real suffering of the Palestinians has been taking place. It has been mostly closed for the past decade, further aggravating the misery of the two million Palestinians of the Gaza Strip. The Egyptians often cite "security reasons" as the main cause for the closure. According to Egyptian security sources, in the past few years there have been increased signs of cooperation between Hamas and some jihadist terror groups in Sinai. Israel's concern is that weapons could be smuggled into Gaza from the sea. This is the reason that Israel maintains a naval blockade along the Gaza Strip. In the past, Iran and Hezbollah have tried to smuggle weapons into the Gaza Strip along its seacoast. Egypt's blockade of the Gaza Strip, however, began long before the emergence of the Islamist terror groups in Sinai. The Egyptian blockade on the Gaza Strip is not, however, motivated mainly by security considerations. The Egyptians simply do not want to be responsible for the plight of the Palestinians in the Gaza Strip. Cairo sees the Palestinians as "troublemakers" and "ungrateful" people, and simply do not want to help them. In the early 1970s, Jordan drove the PLO out of the kingdom in a bloody offensive known by the Palestinians as "Black September." The Lebanese had a similar experience with the PLO when the organization was based in Beirut during the 1970s and early 1980s. There, too, the PLO tried to create a state-within-a-state and posed a serious threat to Lebanon's sovereignty. The Arab countries consider the Palestinians a major headache. The Arabs also consider the Palestinians "ungrateful," especially after the PLO supported Saddam Hussein's invasion of Kuwait in 1990. Kuwait was one of several Arab countries that used to give the Palestinians millions of dollars in financial aid. However, when Kuwait fell into the hands of Saddam, the Palestinians were the first to take to the streets to celebrate the invasion and voice support for the Iraqi dictator. It would make sense if the Palestinians in Gaza were to stage demonstrations near the border with Egypt to demand an end to Egypt's blockade of Gaza. There are good reasons, however, why Palestinians in the Gaza Strip do not do this. They know very well that any attempt to infiltrate the border with Egypt would be met with the full force of the Egyptian army. Recently, the ّIslamic and National Forces, a group of Palestinian factions in the Gaza Strip, called on Egyptian President Abed Al-Fattah Sissi to open the border crossing to allow wounded Palestinians from Gaza to receive medical treatment in Egyptian and Arab hospitals. Again, ostensibly for "security reasons," their appeal was completely ignored. Emad Al-Agha, a member of the ّIslamic and National Forces group, said there are intensive contacts with the Egyptian authorities to pressure Cairo to open the border crossing for "humanitarian" reasons. Reports about the suffering of Palestinian travellers at the Gaza-Egyptian border crossing fill Palestinian media outlets, but these reports are almost entirely ignored by the mainstream media in the West. Western journalists are well aware of the Egyptian border closure, but as Israel is not involved, the reporters and their editors do not really care. Thousands of Palestinians converge on the terminal between Gaza and Egypt whenever there is a rumor that it might be opened. Some wait there for days with their luggage and are forced to sleep out in the open. Some Palestinians are required to pay bribes to Hamas and Egyptian officials to obtain permits to leave the Gaza Strip through the terminal. A Facebook page entitled "The Rafah Border Crossing - Endless Suffering" shows dozens of examples of the humiliation the passengers experience there. Like most Arab countries, Egypt cares nothing about the Palestinians, especially those living in the Gaza Strip. From the point of view of the Arab states, the Palestinians are Israel's problem alone. Yet Egypt is sending Palestinians to knock on Israel's door and blame Israel for the "humanitarian" crisis in the Gaza Strip, while it is really Egypt that is responsible for the blockade of the Gaza Strip. Arab and Egyptian hypocrisy achieves new heights as journalists from these "countries create "fake news" echo chamber reporting on the "'March of Return" and use it to condemn Israel for sealing its border with the Gaza Strip. When will the real blockade of the Gaza Strip, the Egyptian one, be called out and condemned in the mainstream media?